It was a short 2 day trip to France. And since I had been there before, I planned just to have a coffee and a little shopping. So, I went to this café called Shakespeare café or Shakespeare and Company. It was a nice-cute-little café. 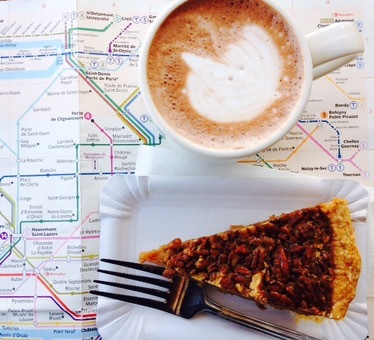 I ordered a slice of Pecan pie and a cup of Cappuccino and they were splendid! A perfect place for a romantic date… if you had a date. It was located across The Notre Dame Cathedral, 37 Rue de la Bûcherie, 75005 Paris, France. But of course, I read the map wrongly so I had to ask people to get there. I just spent an hour or so and continue to La Vallee Village for some shopping. Paris… even a café could be so memorable.